Remember how in this post I mentioned there was a decision we had made that was going to change things for all of us? Ok, well here it is. Most of our family are already aware of it but this update is for those who know nothing. Ready? Yes, you read that right. We are leaving India and moving to Canada. This plan has been in the works for some time now but we only recently made a final decision on it. Now begins the hard work part – the legalities. See, I wasn’t born in Canada so my kids are not automatically eligible for citizenship. We will have to apply for it in the same way Glad will, so to help out, we have retained the services of an atorney who specializes in cases like ours. He is in Canada and knows the ins and outs of what it will take to get citizenship for Glad and the kids. That process is going to take a good 6 to 9 months but hopefully all will be ready by the time we are ready to go. Our aim is to make the actual move sometime in June of next year so that we can get a house and be settled before the school year starts. There is plenty of prep to be done now, lots of which is still up in the air. But there is also fun stuff, like getting passport photos taken. Isn’t she cute? She was shy going in and didn’t want to be put down, but as soon as she saw the special chair and the lights, I think she was mesmerised by it all and she let me leave her so the guy could take her pic. 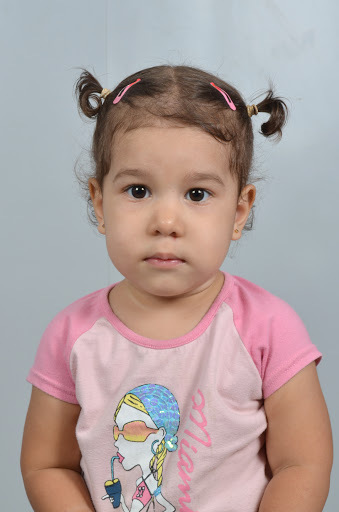 Scarlett’s first passport photo, 23 months old. So now you will hear about the move regularly as I update you on our progress and all the details. It’s exciting, a huge change for us. While Glad and I have both lived in other countries before, our children only know India, so there will be some adjustment there. The first time we mentioned to Logan that we might want to move to Canada, he said he didn’t want to go because I had told him there weren’t any cows on the street there. Ha. He loves his cows.